An attitude of entitlement is one we come across often in South Africa and it often piggy banks on the fight for one’s rights. However, there is a difference between fighting for what is rightfully yours by law or contract and feeling or believing something is yours because you think you deserve it. Unfortunately we are seeing more of the latter in the culture of our society in South Africa, often disguised as the former. Personally, I think it is based on the Esau syndrome, a growing trend in our world. 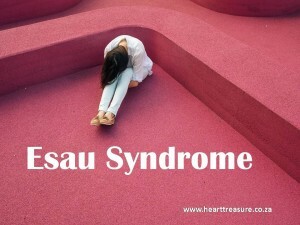 What is the Esau Syndrome? Esau traded long term blessings that were rightfully his by birth, (Gen 25:27-34) for a single meal of what was probably a bowl of lentils. He chose to satisfy his short term need, or appetite without quantifying the long term value of his blessings. It is easy when we see something we really want, to give into our first impulse and get it. In a moment we push or argue for something which we feel we deserve now, without giving due consideration to the longer term costs involved. At first we feel intensely satisfied and empowered because we have obtained something we really wanted, but immediate pleasure often does not have its eyes on the future. Buying material possessions on credit or at the wrong time which have long term implications to our financial position. An illicit relationship we feel we have to have to meet our current desires, without considering the impact it has on other long term relationships, like marriages, children and friendships. It is in giving our children all their desires and demands, without teaching them to work hard. It is serving our appetite for food and drink without considering the long term impact to our health. It is demanding in our workplace without considering the financial health of our employer. It is demanding from our government, without considering the economic future of our country. It is living the way we want to live without considering our eternal destination. The end result of the Esau syndrome is regret. When we consciously trade, (not steal) short term benefits or appetites for long term blessings, we will eventually regret the loss of long term blessings. It is important to think about our choices, to live right and make wise decisions. 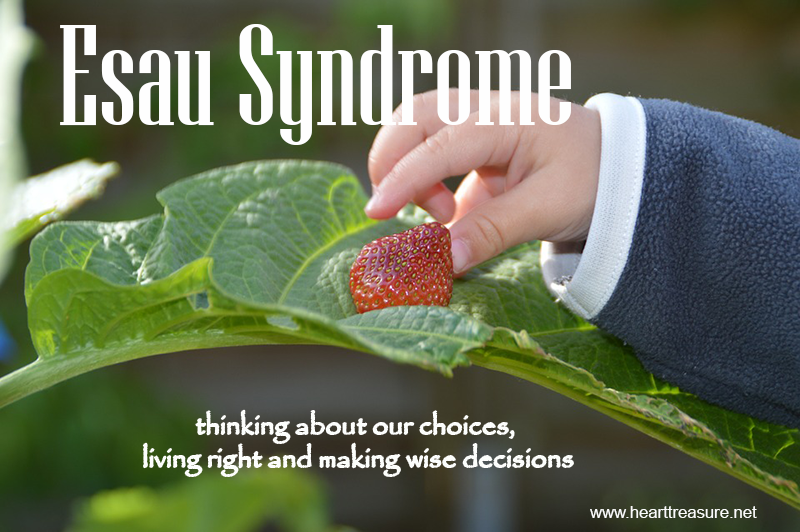 Decisions made with the Esau Syndrome are often made in a moment; spontaneously; with peer pressure; when we are weak or tired; when we have an urge; when we don’t have all the facts and are easily deceived. It fails to look at the big picture, consider all the value and weigh the cost of the long term implications. Let us all make every effort to look out for and identify when the Esau Syndrome is operating in our lives. Father help me to be on my guard when my desires for things that I want, get very strong. Help me not to make decisions in a moment, but to think carefully about my actions and the long term implications. Help me listen to Your voice that warns me in my conscience. Help me to listen to the warnings of loved one’s around me. Help me to value the blessings that you have already given me by birthright, because I am a child of God. No one is ever beyond the love of God, His love cannot be lost or become unavailable to us because His love has nothing to do with us, whether we qualify, how we behave, what we do, what we say etc. He loves us, because He decided at the world foundation, to make us the focus of His love. Then He sent His son Jesus, to pay OUR price for sin, so that we can enter into this love relationship with Him. Even if we know the Lord as our savior,sin in the worst way possible, there is still nothing that can separate or divide us from His love. We merely acknowledge and confess our sin, change our behavior (repent) and walk out in a new freedom. Neither is the forgiveness of others a pre-requisite to God’s love. If God has forgiven us our sins, there is nothing than can prevent Him loving us. You say: “No one will love you when God does not love you.”From God’s love, all other love flows. Start by believing God’s love and loving Him back. All other love flows out of God’s love. You can choose whether to continue in the ways of Esau or not. Your life is your choice. You can also choose to follow Jesus and take Him at His word.The one thing you do have control over, is choice. The Word says that by acknowledging Jesus’ death on the cross for your sin, and accepting Him as your Lord and savior, you can enter into a loving relationship with Him and become a child of God, with that eternal security you long for. 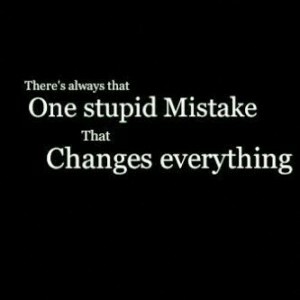 Wow….. Yup, I think this human trait of ours is SUCH a handicap! We live in this time of instant gratification – the world is making it so easy for us to just give in and go with the flow! “Lord help us to lean into the wisdom you make available to us – to discern “needs” against “wants”! Thanks again Michelle for highlighting these areas the enemy so gleefully places in front of us. Thank you Lesley for your constant encouragement in this blog. I think that phrase “instant gratification” sums up much of what lies behind the Esau Syndrome. People don’t believe in waiting anymore, you can see it in the way we drive, we shop, we treat other people. Thanks for sharing.